Everyone has a little different interest in buying a trainer kite. This is a guide to help you understand the different types of training kites and what will be the best fit for you. Your #1 one goal for using a trainer kite is to safely learn kite flying skills, kite control, wind awareness, and to build confidence. To do this we recommend a kite that provides some level of power so that you can gain experience in controlling the kite, increasing and decreasing its power. What's most important is practicing and mastering kite control while having some fun. Trainer kites can be divided by line configuration and kite construction. Simple and Easy - These are mostly 2-line and 3-line trainer kites (rarely 4-line). They come complete with everything you need and are ready to fly. This is the most common type of trainer kites because they are simple and easy to fly. The 3-line kites are the easiest to relaunch. Rig and Fly - These training/practice kites are sheetable depower kites just like the full-size kites used for kiteboarding and snowkiting. The most common is a 4-line configuration. In simple terms, they operate a little like the sail of a sailboat or a wind surfer. The angle of the kite can change by pulling the control bar in or letting the control bar out. It is like pulling the sail in (sheeting in) equals more power, and letting the sail out (sheeting out) equals less power. When learning, these kites are not for everyone and will take a little more understanding to fly. Rig & Fly kites are available in sizes ranging from 2.5m to 8m and will require additional gear. Sometimes the kite and control bar are sold together and sometimes they are sold separate. In order to fly these kites, you will need to purchase a harness and safety leash. 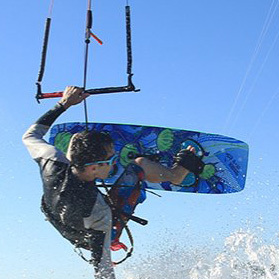 Rig & Fly kites are becoming especially popular with younger riders or lighter weight adults because they can fully engage in both kiteboarding and snowkiting. Single Skin Foil Kites - These are a newer design, but are amazing kites. They are super durable, fly well in really light winds and strong winds, and they put out 30 to 40 percent more power. 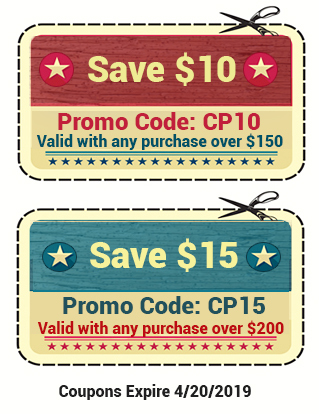 Better yet, they are less expensive, have great performance, and are almost indestructible. They come in 2, 3, 4-line configurations. We carry a 3-line Peter Lynn Uniq. Twin Skin Open Cell Foils- These are the most common and are standard foil kites. These are great kites and fly well in a wide range of wind conditions. Because they are an open cell foil, they can only be used on land and cannot be relaunched from the water. Twin Skin Closed Cell Foils - These trainer kites are like a standard foil kite but have a special design that keeps the water out when they crash on the water. Because of this, they are water relaunchable and can be used on land, water, and snow. This makes these trainer kites very versatile. Inflatables - These kites are not as popular but can be excellent trainer kites. 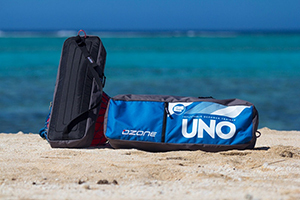 These kites have an inflatable leading edge and are often referred to as LEI kites (leading edge inflatable). Factors that affect your trainer kite choice include: Your individual weight, wind speed, and your kiting interests. All of these play a part in which kite is the best fit for you. Your weight and height are less of a factor than the wind speed and your personality. If you are a smaller person (under 140 lbs), then a smaller size kite may be a better choice for you (2m to 2.5m). If you are over 140 lbs, the 2.5m to 3.5m kites are all a good fit for learning kite flying skills. However, for most people, it depends more on the wind speeds and the level of power you want to experience from your kite. For most adults, 2m to 3.5m trainer kites are a good range for learning kite flying skills. if you are interested in learning snow kiting or getting on a mountainboard, then your weight and the surface you're riding on will become a factor. In an area where the wind speeds average about 12 mph, for most adults, a 2m to 3.5m trainer kite is the perfect range. With this wind speed, a 2m kite is going to provide little pull and a 3.5m kite is going to have a strong pull when flown aggressively. At a 17 mph wind speed, your kite is really going to begin generating a lot more power; as much as 2 times the amount of pull, depending on how aggressively you fly your trainer kite. The stronger the wind, the stronger the power. As winds increase, your kite power multiplies. 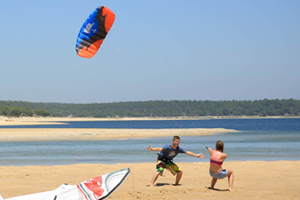 With trainer kites, wind speed has the biggest impact on choosing a kite size. In lighter winds, 5 to 10 mph, a larger kite is better. For example, in light wind conditions, even a 3.5m kite will not produce a strong pull and can be used by a wide range of people. However, once the winds begin to increase beyond 12 mph, a kite's power and pull will really begin to increase. We suggest you start by learning in lighter winds. As your skills and confidence increase, then expand your skills by flying in higher winds (18 to 20 mph+). For most people, higher winds are less common for their area. Most of us live in areas where the average wind speed is 8 to 12 mph, with potentially stronger winds during certain seasons or as different weather fronts move in and out. We all are different when it comes to athletic abilities and personality. So whether you are looking for a kite with strong, medium, or light pull, this impacts your decision on what size kite to buy. With a good stiff wind over 12 mph a larger kite will give you a good work out. Note: A half of meter will have a noticeable difference in the pull you feel. Here are some popular choices, considering an average wind of 12 mph and using the kite just for training (not learning to snow kite or landboard). These trainer kites are all light to medium pull. 3 Line Trainer Kites which are the most popular: Rush Pro 300 & Rush Pro 350, Ignition 2.5m & Ignition 3m, Hydra 300 & Hydra 350, Scout 3m. The larger sizes. 3m to 3.5m, will produce a strong pull and a very strong pull as winds increase. The Scout is designed to have more power per square meter than any of the other trainer kites. 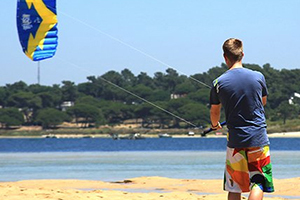 For people who would like to use their kite with family and friends, we often recommend a 2m to 2.5m kite. These sizes have a nice balance of light to medium power in winds under 12mph. The size of the kite is not as important when learning kiting skills, so it's better for your family and friends not to be overpowered. Parents who would like to use a trainer kite with kids (80 lbs+) should fly in winds around 10mph. These sizes tend to allow for a stronger pull in a little stronger winds without being too overpowering. Size does not impact your ability to learn kiting skills. The Hydra II 300 (2.5m) has been a favorite for families who live close to the beach and want to fly over the water. Any less than 2m is very, very small and will produce very little pull. The HQ Hydra 300 and Hydra 350, are the best and most economical water relaunchable trainer kites. With this kite, larger sizes are best for body dragging. If you are 120 lbs or more, the Hydra 300 is a good choice. For 150 lbs and up. the Hydra 350 is the best choice, and for 180 lbs or more, the suggested choice is the Hydra 420 model. If your weight is over 180 lbs you need some floatation as you body drag. Inflatable 4 line kites: The React 2m does not have enough power to body drag unless you're a light weight. With families, the most popular is the Hydra 300 unless the average wind speed is less than 12 mph. Two ways to go on this one. Buy an inexpensive trainer to learn some basics and then go into the real deal. The other is to buy a big enough trainer (3.5m to 4m) that can give you a pull and will allow you to play around. This is best if you are not totally convinced you want to commit to the investment of the full size gear ($800 to $2000) vs ($300 to $500). Peter Lynn Explore 4m. This is a great little package including the Kite, bar, lines, a base harness, and a special third line chicken loop connection to connect to your harness. This is a great way to begin and learn. A couple of other 3 line kites that will give you a pull on hard packed snow would be; The Rush Pro 350, Hydra 350, Hydra420, Skim 350, or Skim 4m. Another option is to look into a sheetable kite with good depower. For someone over 140 lbs, a 4m to 8m is a great place to start if your budget allows. $700 to $1,500. If you are serious, about getting into snonwkiting these kites may be a good investement. The HQ Apex, Flysurfer Viron, or a Flysurfer Peak are fantastic entry level sheetable kites. Trainer Kites are also great beginner kites for landboarding. Any size 2m up 3.5m (true size in square meters) will work on hard packed dirt or pavement. 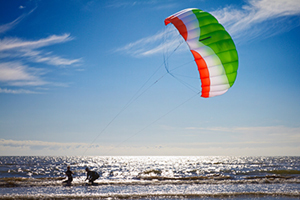 When on grass or wet sand you may need to go up to a 3m to 5m training kite depending on wind conditions and weight. Full size sheetable kites are the best fit for really learning this sport. Like snowkiting, if you are serious these are good kites to begin with: The HQ Apex, Flysurfer Viron, or a Flysurfer Peak are fantastic entry level sheetable kites.